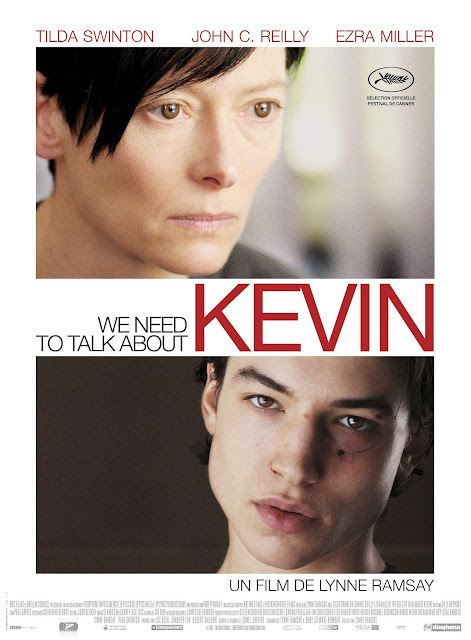 Movie: "We Need to Talk About Kevin"
A mother struggles with how much responsibility she should bare for her son's unthinkable actions. "We Need to Talk About Kevin" is directed by Lynn Ramsay, who helped write the screenplay with Rory Stewart Kinnear. It is based on the novel of the same name by Lionel Shriver. 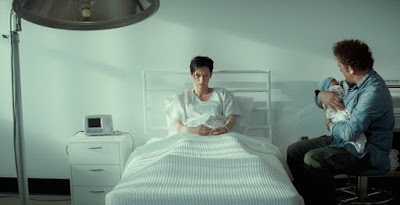 The film stars Tilda Swinton as Eva, a mother who has been dealing with an unspeakable atrocity committed by her son. She has been ostracized by her community and often contemplates how much blame she carries. Joining her is John C. Reilly as Eva's husband Franklin, as well as Ezra Miller, Jasper Newell, and Rock Duer, who all play the titular Kevin at different stages of his life. BigJ and I have a system for picking our "for fun" movies. We alternate between his pick and my pick. It's not that unique, but it keeps things fair, you know? Typically, I choose films I've always heard were great but haven't ever watched. I try to go into movies knowing as little as possible. Let's just say I'm going to start reading plot summaries from now on. There are several things to like about "We Need to Talk About Kevin." It is striking to look at and is superbly directed by Lynne Ramsay. It extremely well acted. Tilda Swinton gives an exuberantly strong performance as Eva as she explores the character through numerous different times in her life. She goes from being a fun-loving world traveler/writer to being a mother and having a difficult time with parenthood. From there, she quickly turns into a social pariah. Eva becomes an outcast through almost no fault of her own. Really, her only crime was having a child at all. Her son Kevin is essentially the anti-christ. He is eviler than Damien in "The Omen." He lacks any empathy and is a complete psychopath. By the time the character is a toddler, the audience has already grown to completely hate him. Yes, it may sound harsh despising a young child, but seriously, some kids are just assholes, and Kevin is certainly one of them. The fact that Kevin is so evil is part of the problem with this movie. When dealing with a subject matter so dark, it's an oversimplification to just say that the kid is simply pure evil. There weren't environmental factors or other explanations, Kevin is just an abomination who is looking to do harm to others the second he pops into the world. We think this is somewhat detrimental to the overall theme of the movie. Eva is supposed to look back on what she did wrong as a parent, but the answer, in this case, is absolutely nothing. She just wound up with a bad egg, the worst egg, for a son. We know that some people in this world are truly just evil people who want to harm whoever they can. "We Need to Talk About Kevin" is utterly depressing in every conceivable way. We feel like this movie is a lesson in cinematic masochism. It's one of those films that exists to see how much heartbreak, sorrow, and dysfunction the audience can handle. It's unbearable and exhausting to watch, even with stellar performances from Tilda Swinton and Ezra Miller in tow. This is a depressing (though well made) sight from beginning to end.